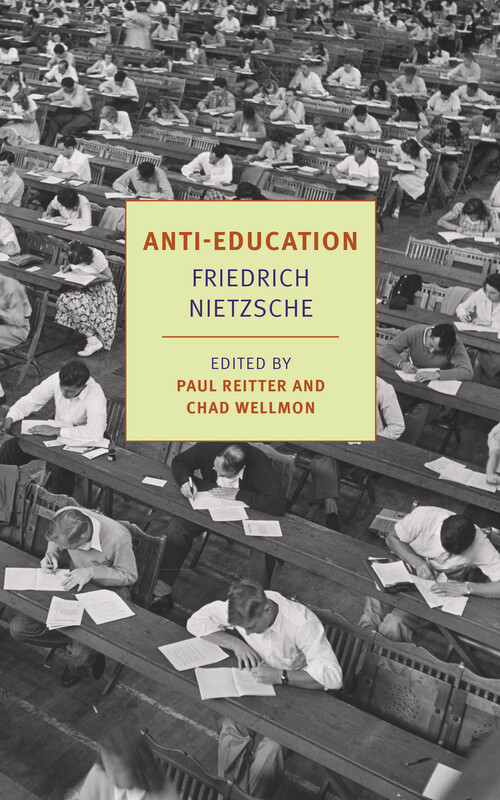 Anti-Education by Friedrich Nietzsche, translated by Damion Searls. NYRB Classics, Dec. 15, 2015. One would have to be going about with eyes sewn shut not to see the unfolding crisis in American higher education. The structural issues are by now rote and familiar talking points—rising tuitions, student debt, the obscurantism of much academic research, and the glut of qualified graduates fiercely competing over diminishing resources. The accelerating contradictions around the objective value of a degree are often acknowledged by administrators who talk about the perils of “reproduction” and urge students to diversify their expectations after years of acclimating them to life within the guild. But the dry-rot can be seen in the spreading cultural revolution around issues of race on campus; in all the pained and mechanical dissertations; in the 90 dollar academic books no one will read and the exposure of certain publishers preying on academics; in the bottomless stream of “why I quit academia” think pieces; but most of all in the silent desperation on so many faces of researchers and professors. They sought out refuge from the brute struggle for survival in the place that seemingly offered the most freedom and the least compromise to capital, but there are fewer and fewer places to hide. 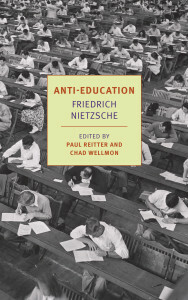 The lectures were recently released as Anti-Education (NYRB Classics, 2015) in a fine new translation by Damion Searls and an introduction by Paul Reitter and Chad Wellmon. As the introduction notes, the writings have been largely ignored, perhaps because of their experimental literary form. It is a kind of lush Bildungsroman that turns into a Platonic dialogue. As with his future work, the prose is ecstatic. Nietzsche intended to collect the lectures into a book called On the Future of Our Educational Institutions, but couldn’t manage to finish the final lecture. The story begins with two old college chums wandering along the Rhine, waiting for members of their secret literary circle to arrive. They shoot rifles and find an old pentagram they carved into a tree and reflect on how little they learned in school. The narrative is laced with the beginnings of the polemic. “It was thanks to our club, we knew, that we basically never thought about a so-called career back then. All too often, the state tries to exploit those years, luring civil servants it can make use of as early as possible and then securing their unconditional obedience with exaggeratedly strenuous exams.” The two boys run into an old philosopher and his young companion, who are also meeting up with someone. After the philosopher’s dog bites Nietzsche, the two groups part ways, but the young graduates eavesdrop on the philosopher’s conversation, forming the bulk of the rest of the book. In his view, the German educational institutions had become institutions for the struggle to survive. Of course, by present day standards, the nine-year classical education of the gymnasium would be considered the height of antiquarian luxury. But “true” education for young Nietzsche meant complete immersion into Greco-Roman antiquity: no picking and choosing based on subjective interests, no personalizing, no obsessing over a single atom or phrase or what Odysseus represented. No winnowing down into a speciality. The important thing was total submission and to lose oneself, as well as to have a mastery of the “mother tongue” to communicate one’s findings and insight from the depths. If the growing “surplus of schools” created a “surplus of teachers” with “no dowry of natural talent”, well, that was just too bad for them. What insights could the average researcher offer on “the very same ancient authors who have never made the least impression on him”? Unabashedly elitist and antiquarian, against mediocrity and the state, Nietzsche offers a vicious and prescient critique laced into a beautiful story. While Anti-Education is fundamentally anti-academic, it was not a 19th century “quit lit” think piece. The old philosopher specifically warns against young people “fleeing into solitude” before they were truly ready—without structure and discipline they would be destroyed. Nietzsche kept his position at the University of Basel for another seven years, where he was, by accounts, a good, respected professor. As the introduction notes, it was not until The Birth of Tragedy made him a pariah that he left Basel to ascetic solitude in Sils-Maria, and even then it was with a stipend. Far from believing in “academic freedom” or independence, there is a persistent obsession with discipline and obedience, and Nietzsche makes repeated veiled references to the need for an intellectual “leader.” Of course, his many exhortations to the “true German culture” are hard to read in light of subsequent German history.